Check out a new SEEC-authored paper recently published in the Philosophical Transactions of the Royal Society B. As the Earth's climate changes, extreme climatic events such as heat waves and floods are becoming ever more common. However, these events are still relatively rare and infrequently observed. This often leads to the situation where researchers have data for only one extreme event, but they are convinced that this event has had a large effect on the organism or system on which they are working. One might think that observing a single event is not amenable to analysis. However, Res Altwegg, Birgit Erni, Vernon Visser (all from SEEC) and Liam Bailey (Australian National University) show that this is not always the case and that observing one extreme event is not the same as having only one data point. 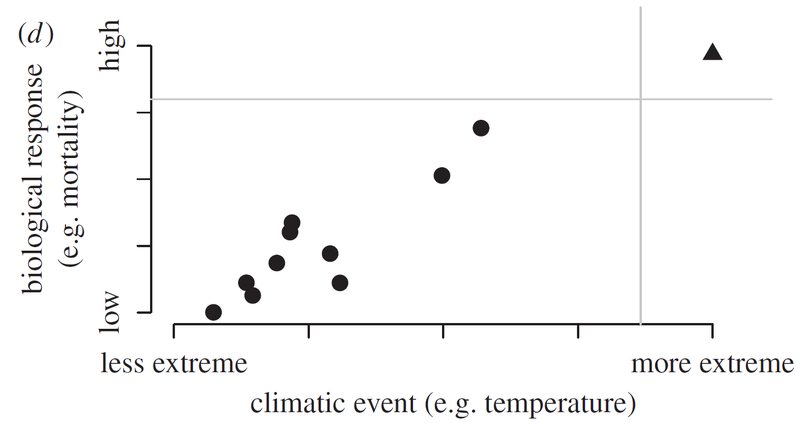 In this paper they provide guidance for how, and under which conditions, one can analyse single extreme climatic events.